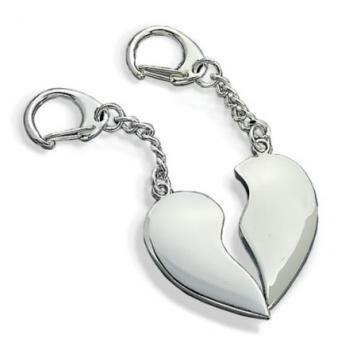 Give one half of this split heart key chain to that special someone and keep the other half for yourself to remind you of your bond. Both heart pieces can be engraved with a monogram. The bright silver finish is nickel plated and will not tarnish. The heart measures 1.75" x 2" when together. Packed in black gift box.